The PFC Elastrofoam Glass & Paint Prep Sponge removes bonded contamination from glass, chrome and plastic without the abrasive effects of harsh polishes. Use PFC Elastrofoam Glass & Paint Prep Sponge with Ultima Waterless Wash as lubricant, which provides the optimum lubrication to prevent window or plastic marring or scratching from contaminants. Bonded contamination like, for example, bird waste, bugs, and particulate contaminants, are easily removed by Sonus Glyde Clay Lubricant. Keep the Glass Sponge clean. During use, rinse frequently in a bucket of soapy water and squeeze to remove excess water. Store in a cool, dry area. Do not allow the Sponge to sit in the hot sun. Prior to use, thoroughly wash the vehicle. Failure to thoroughly wash and rinse may lead to paint scratches from grit and other forms of hard contamination. Feel the paint to find areas of heavily bonded contamination and roughness. Spray rubberized face of the Elastrofoam Sponge and the area to be cleaned with your favorite clay lubricant or detail spray.. Proper lubrication is essential. Never use dry. Work on a small 2' by 2' area at a time. 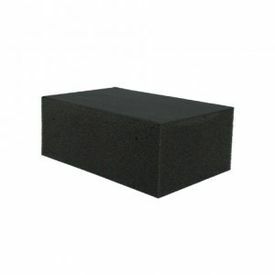 Lightly glide the Elastrofoam Block over the area to be cleaned in a back and forth motion. Note: PFC Elastrofoam Glass & Paint Prep Sponge should be rinsed if dropped, to remove contaminants.